The Civic four-door sedan is made in Ohio (for the sedan's largest marketthe U.S.), Japan, Thailand, and Brazil. The sportiest Civic hatchback is the type-R, powered by the new DOHC, i-VTEC, 2.0-L engine. New models are rapidly proliferating from Honda's Global Compact Platform. Last fall, Honda launched the new Civic in Japan and the U.S., with production simultaneously starting at the Suzuka, Japan, and East Liberty, OH, plants. President Hiroyuki Yoshio declared at the time that Honda would expand new Civic production to factories in 12 countries within a year, a plan that is progressing on schedule. All but the Swindon, Britain, factory produce sedans. In addition, the East Liberty plant will produce the U.S.-exclusive coupe version, and the Japanese factory the "monoform" five-door hatchback. The UK plant concentrates on the Euro Civic, the monoform five-door, and the forthcoming three-door hatchback. The monoform five-door hatchback rides on a 2680-mm (106-in) wheelbase, 60 mm (2.4 in) longer than the sedan's, and has a unique body style with no outer panel interchangeable with the four-door car. It is shorter in length and taller than the sedan at 4285 mm (169 in) and 1495 mm (59 in), respectively, vs. 4435 mm (175 in) and 1465 mm (58 in). The interior is new and will be shared with the forthcoming three-door hatchback. The gearshift/automatic selector lever grows from the lower part of the IP central console, while the sedan's is conventionally placed on the floor. The rear seat is a 60/40-split fold-forward type, enabling increased cargo-carrying capacity. As in the sedan, the floor is flat with no tunnel intrusion, which is achieved by the new body construction, exhaust routing, and placement of the primary muffler adjacent to the under-rear-seat fuel tank. The U.S. Civic is powered by the D17A SOHC, VTEC variable valve-lift/-timing engine enlarged from 1.6 to 1.7 L and in three stages of tune: 86, 87, or 95 kW (115, 117, or 127 hp). The HX Coupe, the "mileage champ" of the Civic lineup, is powered by the lean-burn 86-kW (115-hp) engine combined with a CVT. The Japanese equivalent to this model is the iE sedan powered by the D15B VTEC lean-burn unit in 1.493-L displacement. The latest lean-burn engine has an expanded and extended lean-burn zone, from the previous air/fuel (A/F) ratio of around 19:1 to a band of 21: to 23:1. With this change, the car now cruises at a steady 100 km/h (62 mph) in the lean-burn mode. The exhaust cleansing system is comprised of dual-stage catalytic converters, a "600-cell" three-way catalyst immediately aft of the exhaust manifold in a low-heat-mass stainless casing, and an underfloor NOx-absorbing/-cleansing catalyst. The engine is coupled to Honda's electronically controlled steel-belt-and-pulley CVT. Thus powered, the 15iE sedan attains 20 km/L (about 47 mpg) on the Japanese 10/15-model urban test cycle. The iE five-door's consumption drops to 19.4 km/L due to its heavier mass1170 vs. 1100 kg (2580 vs. 2425 lb)and a slight increase in aerodynamic drag from the sedan's 0.30 to 0.32. The lean-burn D15A produces 77 kW (105 hp) at 5800 rpm and 139 Nm (103 lbft) at 4200 rpm. There are also two stoichiometric versions of the D15 1.5-L engine: an 85-kW (114-hp), 139-Nm (103-lbft) VTEC engine and a 77-kW (103-hp), 135-Nm (100 lbft) non-VTEC unit. The D17A 1.7-L VTEC produces 96 kW (129 hp) at 6300 rpm and 155 Nm (114 lbft) at 4800 rpm. The Civic five-door hatchback was designed primarily for Europe. The Honda Stream is a Civic-platform compact minivan with three-row seating. There are three transmission choices in the Japanese Civic range. The manual five-speed transmission available in the non-VTEC 1.5 sedan and the sporty RS 1.7-L sedan is a new design. The RS unit employs a carbon synchro on the first gear and double-synchro on the second. To preclude crankshaft "knocking," a flexible plate is inserted between the crankshaft and flywheel. The electronically controlled four-speed automatic has an improved grade-logic function. The revised Honda CVC (a CVT), called "Multimatic S" in Japan, has succeeded in overcoming a typical CVT quirkthe sensation that the engine accelerates faster while the car tries to catch up with it, matching engine and car speed more appropriately. The sedan range includes all-wheel-drive models powered by 1.5-L VTEC/non-VTEC engines with a five-speed manual or four-speed automatic transmission. Honda's twin-pump, on-demand torque transfer system is used. The Global Compact Platform features a new chassis with a front MacPherson strut suspension with toe-control function and a rear "reactive-link" SLA suspension. The steering gear assembly is mounted high on the bulkhead instead of the previous location on the subframe. Long tie rods steer the struts, acting as toe-control links to produce more linear toe-change characteristics on the suspension's bound and eliminating the conventional MacPherson strut's shortcomings. Electric power steering (EPS) is adopted across the board in the Japanese Civic range vs. the overseas models' hydraulic system. The EPS is similar to the one in the Insight gasoline/electric hybrid car (and shares some components with the Insight), with the outboard motor acting on the pinion shaft. The Stream's IP is similar in design to that of the three-/five-door hatchback's with the shift lever mounted on the central console. Production of the three-door Civic is assigned to the Swindon, UK, factory. The U.S. market will receive the sporty Si model, while Japan will get the hotter type-Rboth powered by performance versions of the new-generation K20A dual-overhead-camshaft, 16-valve, VTEC/VTC (the latter a continuously variable intake-valve-timing system) 2.0-L engine. The engine is labeled "DOHC i-VTEC" in the sales catalog. The Si unit is rated at 119 kW (160 hp) at 6400 rpm and 176 Nm (130 lbft) at 5000 rpm, while the type-R unit produces in excess of 149 kW (200 hp). The type-R engine is shared with the forthcoming Acura RSX sports coupe. The first vehicle to adopt the new DOHC, i-VTEC, 2.0-L engine is the Stream compact minivan. The Stream seats up to seven people in three-row seating. Being less than 1700 mm (67 in) wide and having two engines with displacement under 2.0 L, it qualifies as a small vehicle by the Japanese definition. It is 4550 mm (179 in) long on a 2720-mm (107-in) wheelbase, 1695 mm (67 in) wide, and 1590 mm (63 in) tall. Mass ranges between the base front-wheel-drive model's 1310 kg (2890 lb) and the top 2.0-L, all-wheel-drive version's 1460 kg (3220 lb). The Stream's new 2.0-L, DOHC, i-VTEC engine is Honda's first transversely mounted inline four-cylinder engine that turns clockwise. 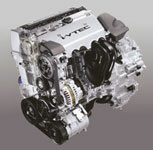 The K20A DOHC i-VTEC engine is the first of Honda's new-generation inline four-cylinder engines. It is the manufacturer's first transversely mounted I4 that turns clockwise with the transaxle placed inline on the left side of the engine/vehicle. All other Honda transverse fours to date have turned counterclockwise, with the transmission on the right. This oddity was the legacy of the SOHC inline two-cylinder engine designed by engineering prodigy Nobuhiko Kawamoto, who years later ascended to the presidency of the company. The pint-size twin 0.360-L engine powered the Life light car of the early '70s. To provide enough foot space for the driver, the engine was pushed to the left and made to turn counterclockwise so that it could drive the inline transaxle without an extra gearset. The first-generation Civic engine, a 1.2-L unit, was essentially two Life engines coupled together. The unconventional design wisdom stuck and has since been the hallmark of all Honda I4s. All Honda V6s, which are of more recent designs, rotate clockwise. The K20A has "square" internal dimensions86.0-mm (3.39-in) bore and stroke, obtaining a total displacement of 1.998 L. True to the Honda tradition, it is an all-aluminum unit. The cylinder block has cast-in iron liners and is split at the crankshaft center. The gravity-die-cast lower block carries five main bearings. An aluminum casing under the front of the engine houses short, twin, contra-rotating balance shafts similar to Nissan's new QR20/25 inline four-cylinder engine. A dedicated chain drives the balance shaft system at twice crank speed. The rear balance shaft directly drives the oil pump. The front-wheel-drive Stream is equipped with a new electronically controlled, fice-speed automatic engine. The K20A engine employs dual-overhead camshafts operating four valves per cylinder via roller-rockers. A single-stage roller chain drives the camshafts. The i-VTEC designation indicates that it combines intake-side VTEC variable lift/timing with the VTC continuously variable intake-valve-timing control by means of a hydraulically actuated vane-type device. Additionally, the DOHC i-VTEC engine features a variable-length induction manifold. The engine's intake side faces forward and the exhaust to the rear, shortening the distance to the primary three-way catalytic converter. A NOx-absorbing and -cleansing catalytic converter is placed downstream of the exhaust system to reduce emissions during lean-burn operation. The lean-burn K20A engine produces 113 kW (154 hp) at 6500 rpm and 186 Nm (137 lbft) at 4000 rpm. The stoichiometric-combustion K20A with 119-kW (158-hp) and 190-Nm (140-lbft) output powers the heavier all-wheel-drive models. The front-wheel-drive Stream is equipped with an electronically controlled, five-speed automatic transmission with manual gear-selection facility, while the AWD is fitted with the four-speed automatic. The AWD system is Honda's dual-pump on-demand type. The D17A SOHC, VTEC, 1.7-L engine with the four-speed automatic is also offered in the Stream package. The chassis is similar in design to that of the Civic, with MacPherson strut front and double-wishbone rear suspensions; however, the steering is hydraulically assisted.